Wilcom Software Training Class Assignments | On Line Classes | Strawberry Stitch Co. If you have already registered for a class please sign in here at class time. Welcome to the EDS ON LINE class assignment area. In this area you will find class assignments that pertain to the Wilcom classes conducted on-line by the Embroidery Design School. 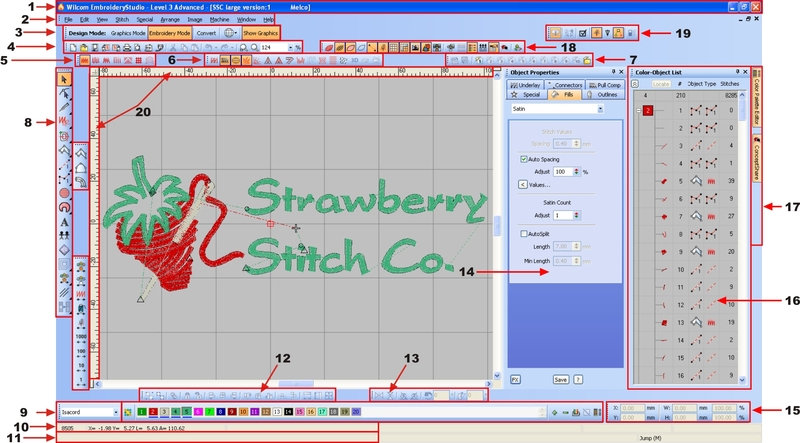 Students are welcome to download assignments which pertain to their studies of CorelDraw taken through Strawberry Stitch Company's Embroidery Design School. Completion of assignments is not a requirement of participating in class instruction. Class assignments are intended to supplement class time by providing the student either self-evaluation or instructor evaluation of their work performance. At this time there are not additional fees for participating in this service and the Embroidery Design School encourages all students to participate. To provide practice of program layout. To have attended the class Wilcom 1.1 in the past two weeks. The ability to download any and all portions of the practice assignment. Complete assignment within two weeks of attending the class. Calibrate your computer's monitor as taught in class. Download the artwork provided (see below) and use the diagram to complete the assignment. Complete this on-line assignment using the diagram downloaded. To have attended the class Wilcom 1.2 in the past two weeks. Study program layout diagram found below and prepare for class discussion. To have attended the class Wilcom 1.3 in the past two weeks. Create a folder on your computer for savings access codes. To have attended the class Wilcom 1.4 in the past two weeks. To provide a refresher of Colorways and Thread color assignments. To have attended the class Wilcom 1.5 in the past two weeks. To provide a refresher of ways to select objects and view methods using the Color/Object list. To have attended the class Wilcom 1.7 in the past two weeks. To have attended the class Wilcom 1.8 in the past two weeks. Save the file as Wilcom18CA.EMB and email using this link. Complete this on-line assignment here. Create a text item with the following properties. To have attended the class Wilcom 1.9 in the past two weeks. Save the file as Wilcom19CA.EMB and email using this link. There is not a questionnaire portion to this week's assignment. To have attended the class Wilcom 2.1 in the past two weeks. To have attended the class Wilcom 2.4 in the past two weeks. Use Windows Notepad to open the downloaded file. To provide a refresher of Pull compensation, Column width, Stitch shortening and Fractional spacing. To have attended the class Wilcom 2.8 in the past two weeks. To have attended the class Wilcom 2.9 in the past two weeks. Save the file as Wilcom291CA.emb, Wilcom292CA.emb and Wilcom293CA.emb file and email in a single message using this link. To have attended the class Wilcom 3.1 in the past two weeks. Create a Run stitch object using Figure A. Create a Run stitch object using Figure B. Create a Triple Run stitch object using Figure C.
Insert the art file of your choice (from the three files unzipped) in your embroidery software as normal. To have attended the class Wilcom 3.2 in the past two weeks. The ability to download any and all portions of the assignment. Follow the instructions below to complete the practical portion of the assignment class assignment. Create a C-Input object using Figure A. Create a C-Input object using Figure B. Create a Back Stitch object using Figure C.
Create a Stem Stitch object using Figure D.
To have attended the class Wilcom 3.3 in the past two weeks. Create Input A object using Figures A. Create Input B object using Figures B. Create Complex Fill object using Figures C.
To have attended the class Wilcom 3.4 in the past two weeks. Create Fusion Fill object using Figure A. Assign a Edge Run underlay. Create Fusion Fill object using Figures B. Assign a Double ZigZag underlay. To have attended the class Wilcom 3.6 in the past two weeks. Create a Complex fill for the white background area of the design. Create the outer red border using Input A. Create the inside red border using Input C.
Scan the sew out with the cut away backing and email it along with the design in .EMB format using the email link above. To have attended the class Wilcom 3.7 in the past two weeks. Create the outer and inner red border using Input C.
Create the text "MISSOURI" using the Alphabet tool. Do not use a TrueType Alphabet. Create the text "St. Louis" using the Alphabet tool. Do not use a TrueType Alphabet. 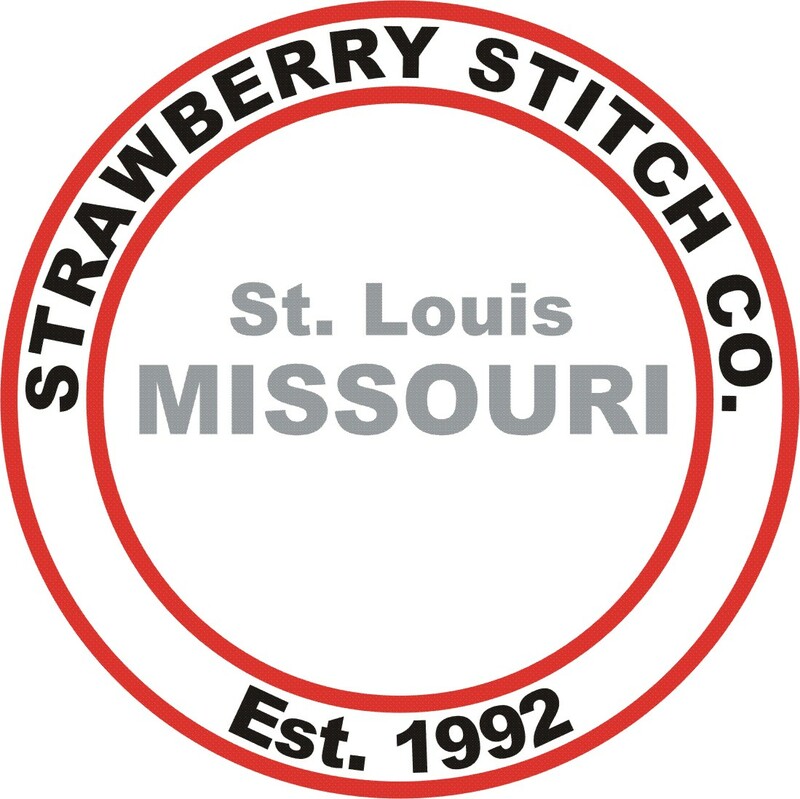 Create the text "Strawberry Stitch Co." using the Alphabet tool. Do not use a TrueType Alphabet. Create the text "Est. 1992" using the Alphabet tool. Do not use a TrueType Alphabet. To have attended the class Wilcom 3.8 in the past two weeks. Omit the text "Strawberry Stitch Co." and "Est. 1992"
Scan the sew out with the cut away backing and email it along with the design in .EMB format to the address above. To have attended the class Wilcom 3.9 in the past two weeks. To have attended the class Wilcom 4.1 in the past two weeks. To have attended the class Wilcom 4.2 in the past two weeks. To have attended the class Wilcom 4.3 in the past two weeks. Using the top shape create an Input A object with a Contour stitch. Using the middle shape create a Complex Fill object with a Tatami Stitch and a Florentine effect. Using the bottom shape create a Complex Fill object with a Tatami Stitch and a Liquid effect. To have attended the class Wilcom 4.4 in the past two weeks. Using the top shape create a Custom Program split pattern. Name the Custom Program Split pattern "Sheet". Using the bottom shape create a Complex Fill object with a Program Split. To have attended the class Wilcom 4.5 in the past two weeks. Using shape A create a Motif Fill to include the hole. Use Reshape to adjust a smooth flow of the Motif pattern at the acute angles. To have attended the class Wilcom 4.6 in the past two weeks. Using Figure A create a Motif pattern. To have attended the class Wilcom 4.7 in the past two weeks. Using Figure A create a Branched object using the Run stitch tool. To have attended the class Wilcom 4.9 in the past two weeks. Using Figure A create a Complex Fill with a Tatami Stitch type. Using Figure B create a Complex Fill with a Tatami Stitch type. To have attended the class Wilcom 5.2 in the past two weeks. Using the two rectangles create two separate Auto Appliqué objects. Enter your email below to join or change your email listing. © 2010-2016 Strawberry Stitch Co. All rights reserved.